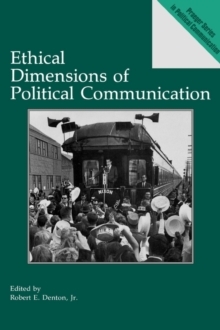 This unique study is the first to focus specifically on political communication ethics. Denton has brought together a group of works that address ethical concerns related to political communication, including political culture, campaigns, media, advertising, ghostwriting, discourse, politicians, and new technologies. All of the contributors raise a number of salient questions and discuss various methods, criteria, and issues for exploring and addressing ethical concerns. These ten chapters cover a range of topics that include the ethics of popular culture, political advocacy, ethics and morality in American presidential campaigns, virtue and character, the role of television in modern politics, the ethical implications of ghostwriting, polls and computer technology, and narrative form in political news. The central theme that emerges from these varied contributions is that we cannot depend on politicians, their handlers, or the media to correct real or perceived problems of ethics in American politics and that the greatest threat to democracy is neglect of the public forum. In analyzing the weak ethical links in the American political process, the authors call for a return to civic culture based on communication and persuasion, active citizen participation, and a high level of information. This work will be an important new resource for courses in political and mass communication, political ethics, and political science, as well as for students of sociology and American studies.